We’d love your help. Let us know what’s wrong with this preview of The Stress of Battle by David Rowland. To ask other readers questions about The Stress of Battle, please sign up. This is a great work of Operational Research by David Rowland. The Stress of Battle: Quantifying Human Performance in Combat is the end result of years of work by David Rowland and his team at the Ministry of Defence. Rowland was the father of historical analysis as a branch of Operational Research. This particular work looks at a combination of field analysis experiments in the 1980s using lasers, well documented WW2 engagements and a handful of battles from other wars. Almost every page in it i This is a great work of Operational Research by David Rowland. The Stress of Battle: Quantifying Human Performance in Combat is the end result of years of work by David Rowland and his team at the Ministry of Defence. Rowland was the father of historical analysis as a branch of Operational Research. This particular work looks at a combination of field analysis experiments in the 1980s using lasers, well documented WW2 engagements and a handful of battles from other wars. Almost every page in it is packed with evidence or explanations of the complex methodology used to ensure that you could get controlled results from an otherwise messy and chaotic environment. If you are playing or designing wargames then this is one of the books that you absolutely must have on your book shelves (and have read too). David Rowland has written an extraordinary book. Starting with the unexpected results of tests in the 1970s, which used new technology to examine the effectiveness of troops in military exercises (revealing a significant degradation in performance), Rowland moves on to show how these findings were extended through the use of statistical analysis of actual combat situations. The findings were a revelation - troops in combat were perhaps only 15% as effective as on the firing range, even though th David Rowland has written an extraordinary book. 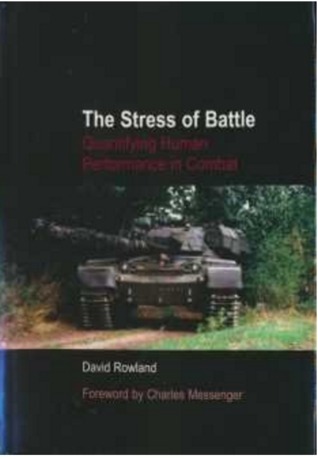 Starting with the unexpected results of tests in the 1970s, which used new technology to examine the effectiveness of troops in military exercises (revealing a significant degradation in performance), Rowland moves on to show how these findings were extended through the use of statistical analysis of actual combat situations. The findings were a revelation - troops in combat were perhaps only 15% as effective as on the firing range, even though their lives depended on how well they fought. Moreover, many troops seem to have been completely ineffective, taking no active part in the battle. Through a mass of analysis, Rowland explores the effectiveness of suppressive artillery fire, anti-tank guns compared to tanks, heroism on the part of artillery crews (officers and SNCOs seem to bring crews up to near-ideal performance, making them many times more effective than ordinary crews), and the probability of attacks inflicting shock on the enemy. But it is perhaps that issue of the mass of analysis that represents the other factor that makes this book extraordinary. Rowland clearly starts form the position that his reader is mathematically highly literate. The book is full of graphs, showing complex relationships, with significance levels and relative performance expressed in numerical form. For the non-mathematical reader, the result is to make the content very difficult to access. And, since the evidence is all presented mathematically, Rowland clearly feels little need to summarise his findings in prose. As a consequence, this is a book that should be essential reading for anyone interested in the practical reality of why combat develops the way it does, yet most of the necessary readership will struggle with it. While Leo Murray's recent volume, Brains & Bullets provides a much more accessible entry to the topic, the sheer evidence base of Rowland's book makes this in many ways a more important work.